Thirty-six Bald Eagles were sitting on the ice of Smith’s Bay, Lake Minnetonka, Thursday morning. They're hunting waterfowl. Last year at about this time eagles were hunting over open water in the same place, and also on Wayzata Bay (photos below). 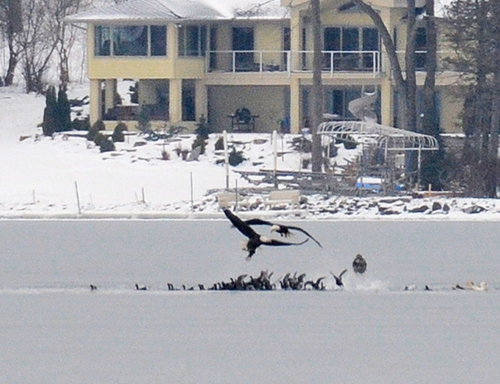 The eagles were seen Thursday from an eastern shoreline road in Minnetonka Beach. The first possible turn to the left from westbound County Road 15, just beyond the Arcola bridge, takes you to a vantage point. The birds, however, are at least a quarter mile offshore. I could see with binoculars hundreds of Common Mergansers, usual on the lake as the ice forms, coots, and three airborne Trumpeter Swans. Eagles can be seen from County Road 15, but there is no place to park. Viewing must be done elsewhere. The road has narrow shoulders and heavy traffic.